It just so happened that around the same time my friend Mike got hired to work at the 18th century historical site that used to pay my tuition, I finally found documentation relating to "housewives" of the epoch. 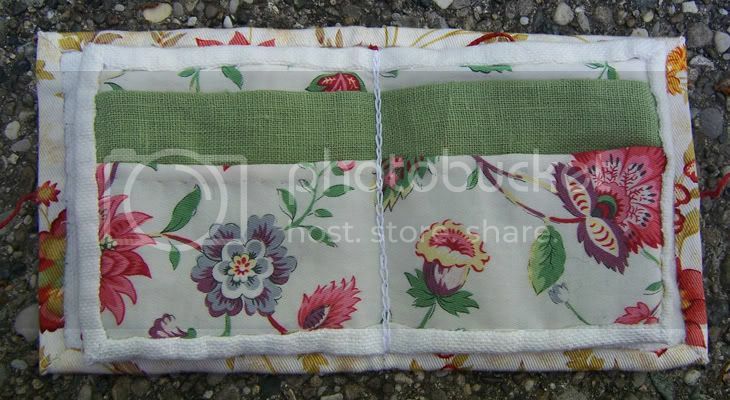 In Civil War reenacting circles, it's common for soldiers to carry little sewing kits called housewives. Beth Gilgun says in Tidings from the 18th Century that her husband carries one while reenacting French & Indian War, but she has no citation for it and I haven't had much luck with finding any extant artifacts of the kind. As far as I can tell, they're a reenactorism--fairly widely used, but not cited anywhere I've found yet. If you have any documentation, please feel free to pass it on. 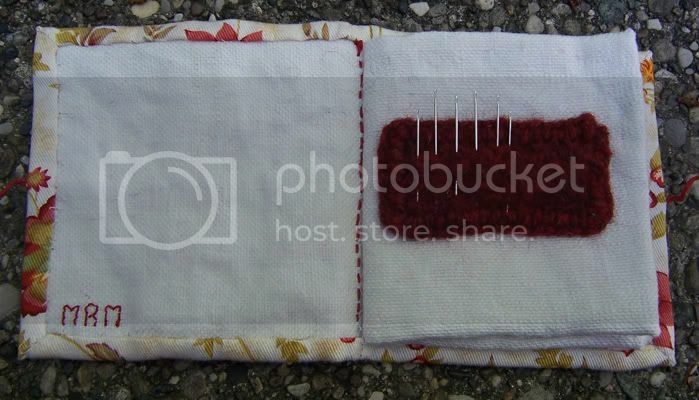 However, 18th Century Embroidery Techniques by Gail Marsh says, "Needles were kept in a cylindrical needlecase or a needle book with wool flannel leaves..." (Marsh 15). Okay, so a needle book is slightly more documentable. 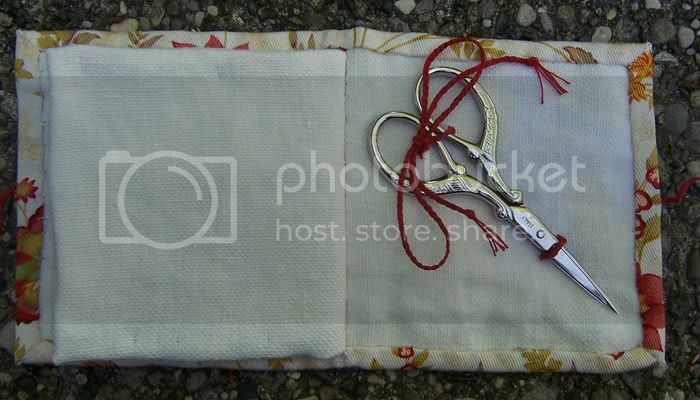 There's also a quote a page farther on, mentioning a similar object that seems to be a whole sewing-kit; it has scissors, bodkin, etc. That one was far more elegant than mine; silk and spangles, lined in satin...but by the description of its function, it sounds similar to what I've come up with. People weren't stupid then; logic and functionality haven't really changed all that much over a couple hundred years. Here's the inside of the cover and the first "page." Mike's initials are embroidered in the bottom corner. I had to knit up that little pad of wool on the facing page and felt it on my own because all the wools I own (aside from those I've set aside for the French regimental) are blends and refused to felt satisfactorily. So I busted out some chopsticks (don't laugh!) to knit up a little rectangle, since I gave all my knitting needles away a few months ago, and made my own little wool felt pad. It's blanket-stitched onto the page with more of the same wool yarn. I've been told the needles should be stored in wool because the lanolin keeps them from rusting. 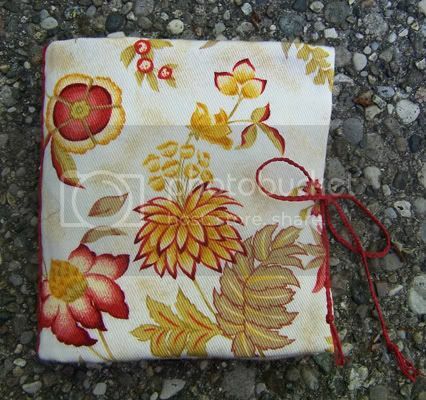 The middle pages; the pockets are for thread winders and maybe buttons. Or really, anything else one might need that could possibly fit in there. The back cover inside, complete with nifty little purchased scissors. Those are debatably farby, but they're small and unobnoxious...and I had a coupon plus my employee discount at work to put towards them. The whole thing is just a little bigger than the palm of my hand, small enough to be stashed in a waistcoat pocket or cartridge box.